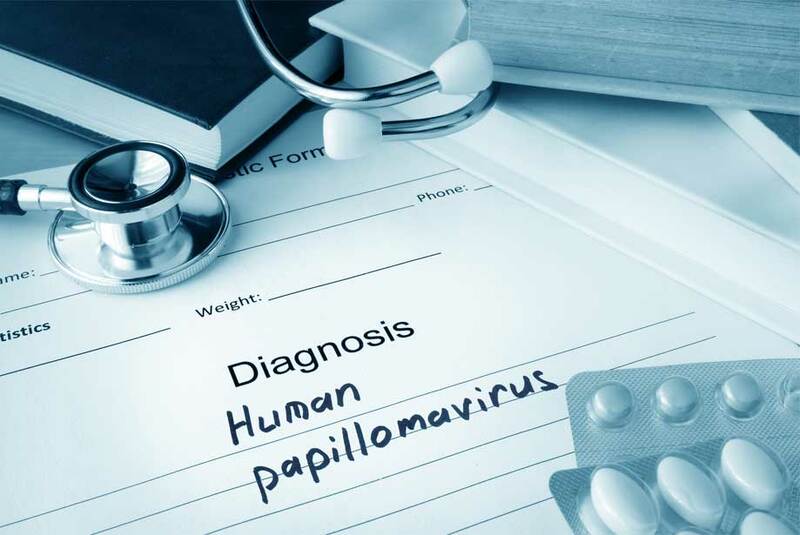 Human papillomavirus (HPV) is a group of more than 150 related viruses named for the warts (otherwise known as papillomas) that some HPVs can cause. Each strain of HPV virus is given a number which is known as its HPV type. HPV is the most common sexually transmitted infection (STI); in fact it is so common that nearly all sexually active men and women get it at some point in their lives. About 80 million Americans are currently infected with HPV and about 14 million people become newly infected each year. Though most HPV infections go away on their own within a couple of years, some HPV infections do persist. HPV infections that linger can cause changes in the cells in the infected area, which can lead to genital warts or even cancer. As a result, every year approximately 17,600 women and 9,300 men in the USA are affected by cancers caused by HPV – the equivalent of a new case every 20 minutes. Also, 20-25% of all head and neck squamous cell carcinoma (HNSCC) as well as 60-70% of all oropharyngeal squamous cell carcinoma are attributable to HPV infection. HNSCC represents the sixth most common cancer worldwide, with an annual incidence of approximately 400,000 cases. Accordingly, monitoring HPV status has become a powerful prognostic and diagnostic tool for these cancer types. Overproduction of the cellular protein p16INK4a (p16) by immunohistochemistry (IHC) is widely used as a surrogate marker for HPV infection. p16 is a cyclin-dependent kinase inhibitor whose up-regulation reflects dysregulation of the retinoblastoma (Rb) pathway. Overproduction of p16, as a result of inactivation of Rb by the HPV viral oncoprotein E7, is therefore considered an excellent and cost-effective marker for HPV-related HNSCC particularly in surgical specimens. The inclusion of HPV testing is also recommended as part of the workup and management of cervical metastatic squamous carcinoma with occult primary tumor to help facilitate location of the unknown primary site and to attempt treatment deintensification if the lesion is HPV positive. In surgical specimens a validated criterion for p16 positivity is diffuse and strong nuclear and cytoplasmic staining in at least 70% of tumor cells. Nonetheless, results obtained by p16 IHC staining should further be validated through assessment of the HPV-DNA status by in situ hybridization (ISH) using specific DNA probes since p16 overproduction can also be induced by non-viral mechanisms, most likely resulting in an overestimation of the true prevalence of HPV-related cancer cases. As fine needle aspiration (FNA) material from neck metastases is a valuable alternative to surgical biopsies and sometimes the only source of diagnostic tissue available at all, Bin Xu and colleagues from the Memorial Sloan-Kettering Cancer Center in New York aimed to establish reliable criteria for p16 evaluation in cytological samples that could be comparable to p16 IHC results obtained from surgical specimens. To achieve this goal, surgical specimens and cells obtained from FNA of the cervical lymph nodes of 60 HNSCC patients were analyzed by p16 immunostaining and chromogenic in situ hybridization (CISH) using Enzo’s PATHO-GENE® HPV type 16/18/31/33/51 probe against high-risk HPV types. The results for p16 IHC in surgical specimens and CISH for high-risk HPV in cytology specimens were used as gold standard tests for analyzing the concordance between cytological and surgical p16 results, as well as between cytological p16 immunostaining and CISH results. The study showed an excellent correlation between p16 immunostaining and HPV-CISH in FNA material and p16 IHC in surgical specimens. However, the high recommended 70% threshold for p16 IHC used in surgical specimens to identify HPV-related squamous cell carcinoma yielded low sensitivity and low negative predictive value and should therefore not be applied to FNA materials. Instead, the overall best practical cutoff to determine if an FNA specimen is positive for p16 overproduction appeared to be 10% immunostaining. Nevertheless, Bin Xu and colleagues still recommend repeating p16 IHC on corresponding surgical specimen to avoid false-negative results from the FNA p16 immunostaining. From our superior ISH virus detection tools to our broad IHC portfolio, Enzo Life Sciences provides a complete set of IHC/ISH reagents, some of which are described below. B. Xu, et al. The utility of p16 immunostaining in fine needle aspiration in p16-positive head and neck squamous cell carcinoma. Hum. Pathol. (2016) 54: 193.